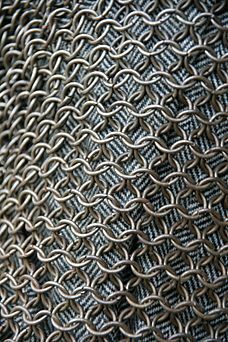 Mail, or chain mail, is a type of armour. It is made of small metal rings linked together in a pattern to form a mesh. The Celts are usually credited with inventing mail armour. Celtic mail was usually made in the form of a vest. The origins of the word "mail" are not fully known. One theory is that it originally comes from the Latin word macula, meaning "spot" or "opacity". Another theory relates the word to the Old French "maillier", meaning “to hammer” (related to the modern English word "malleable"). A mail shirt is a called a hauberk (haubergeon or byrnie). Mail leggings were called chausses. A mail Hood is called a coif and covered the head, neck and shoulders. Many scholars think mail was invented by ancient Celts about the 3rd century BC. At that time their iron work was probably the best in Europe. The Romans quickly adopted it for their own army. A shirt of mail armour weighed about 30 pounds (14 kg). After a battle it was common practice to strip weapons and armour from the dead. Vikings were known to wear mail armor whenever they could get their hands on it. Mail was expensive, time consuming to make, and required a supply of iron. It became more expensive as improvements were made in materials and workmanship. Mail armour was in use in Europe until the 15th century. Mail is today used in gloves to prevent cuts by butchers and firefighters. Some divers wear mail suits when swimming around sharks and particularly when feeding sharks. But mail is heavy and it makes moving around more difficult. Mail is very popular by history reenactors. It is also popular in live action role playing. A historical mail shirt . A woman wearing a haubergeon and coif . Riveted mail and plate coat zirah bagtar. Armour of this type was introduced into India under the Mughals. Statue of a Gallic warrior in mail. Roman soldier 175 A.D. from a northern province (re-enactment). A modern example of the use of mail, a bracelet using the roundmaille weave. Edo period 1800s Japanese (samurai) mail socks or kusari tabi, butted rings. Japanese Edo period mail jacket, butted rings kusari katabira. Edo period Japanese (samurai) mail gauntlets kusari han kote, butted rings. A rare example of Japanese riveted mail, round riveted rings. Examples of Edo period Japanese (samurai) mail kusari. Close up of Mughal riveted mail and plate coat zirah Bagtar, 17th century, alternating rows of solid rings and round riveted rings. Close up detail of Mughal riveted mail hood kulah zirah, 17th century, alternating rows of round riveted rings and solid rings. Mughal riveted mail and plate coat zirah Bagtar, 17th century, alternating rows of round riveted rings and solid rings. Mughal riveted mail hood kulah zirah. 17th century, alternating rows of round riveted rings and solid rings. 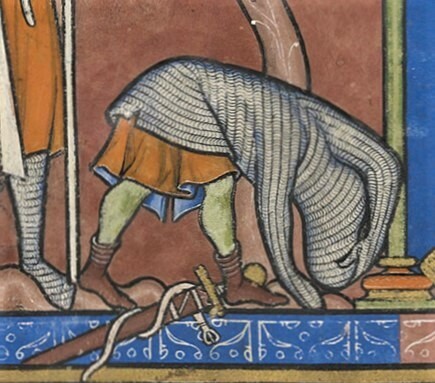 "David rejects the unaccustomed armour" (detail of fol. 28r of the 13th century Morgan Bible). The image depicts a method of removing a hauberk. Indian theta link mail (bar link mail), alternating rows of solid theta rings and round riveted rings, 17th century. Ottoman riveted mail, alternating rows of round riveted links and solid links, 16th century. European wedge riveted mail, showing both sides of the rings, 16th to 17th century. Chain mail Facts for Kids. Kiddle Encyclopedia.